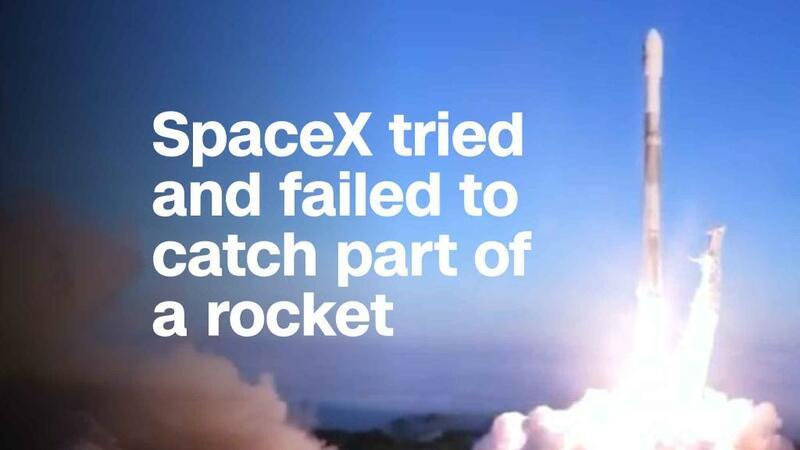 SpaceX tried to catch part of a rocket with a net. It didn't work. At the last minute, SpaceX called off plans on Thursday to launch the new rocket it hopes will eventually carry astronauts into space. The company had planned to test out the newest version of the reusable Falcon 9 from NASA's Kennedy Space Center in Florida on Thursday afternoon. But less than a minute before takeoff — at 5:47 p.m. ET — SpaceX received an "abort" message, and couldn't get things back on track within the window available to launch the rocket. SpaceX will try again on Friday between 4:14 p.m. ET and 6:21 p.m. ET. The rocket, and the satellite it's carrying, are both in "good health," the company said in a tweet. Standing down today due to a standard ground system auto abort at T-1 min. Rocket and payload are in good health—teams are working towards tomorrow's backup launch opportunity at 4:14 p.m. EDT, or 20:14 UTC. This would have been the first trip for the so-called Falcon 9 Block 5, which is designed to meet NASA's requirements for human spaceflight. SpaceX plans to reuse this rocket as many as 10 times. In the past, SpaceX rockets have been only capable of making about two trips. Another key update: this rocket is built so that it won't need to be refurbished between flights. "The only thing that needs to change is you reload propellant and fly again," CEO Elon Musk said in a call with reporters Thursday. "Just like an aircraft," he later added. The Falcon 9 Block 5 is supposed to deliver the Bangabandhu-1 communications satellite into orbit. Once in place, the satellite will provide telecom services for Bangladesh and the surrounding region. An important part of the mission will be landing the rocket's first-stage booster once it returns to Earth. SpaceX will have its drone ship, called "Of Course I Still Love You," stationed in the Atlantic Ocean to catch it. Earlier in the day, everything appeared to be on track. SpaceX tweeted that the rocket and its payload were in good shape. Musk said before the launch on Thursday that he was feeling anxious, since a considerable number of things could go wrong. "I'm stressed. Any good wishes would be appreciated," Musk said, about two hours before scheduled takeoff. -- CNNMoney's Jackie Wattles contributed to this report.